14 May SHOWCASE:The Wine and Truffle Co. 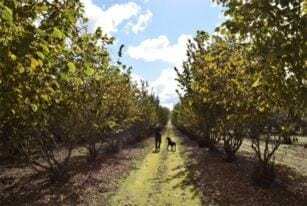 Although exact figures for truffle production in Australia are hard to come by, it is understood that Manjimup in Western Australia is responsible for 80-85% of the country’s entire truffle yield. This beautifully lush part of the world, approximately 4 hours’ drive south of Perth, seems to have all the right conditions for truffle growing – the perfect climate, the right soil, clever nurserymen and passionate growers (the CSIRO also played a critical role in the 1990s in investigating indigenous truffle spores in the region prior to the inoculation of truffle trees). A major producer in the area is the Truffle and Wine Company (T&W). Run by Alf Salter, it is one of the most successful truffieres in the country and is considered to be the largest producer of truffle in the world! Alf’s achievements are remarkable and he, along with his team, continues to expand the industry by thinking innovatively and promoting Australian truffle both here and overseas. Oh but these truffle successes have not stopped Alf from doing some hard yakka on the farm. Stuart, Harry and the team at T&W have done a great deal of research into truffle growing, experimenting with different methods and techniques, and collecting data on just about everything to do with truffle…only to find that truffle growing is an elusive process and the most of the research into growing and harvesting truffle is inconclusive! However, what they have learnt is not get in the way of nature and this is their guiding principle: “We’ve learnt to let nature do its thing”, says Stuart. They employ a 3-year cycle approach to pruning – the tree canopies to grow for 3 years and are then cut back. This process is staggered across the plantation. This is partly due to the understanding that the tree roots mirror the canopies and so by allowing the trees to grow, they build a rich web of roots under the trees. They also do this for practical reasons – they have 13,000 trees to prune. The size of this truffiere makes May to September an incredibly busy time. T&W use eight dogs, harvesting seven days a week during this four month period. The dogs hunt for approximately an hour (or until they get bored or don’t want to do it anymore). Three dogs – Bella, Rosie and Geordie (Geordie is currently in training…and is slightly manic…she did jump into the back of our car whilst we were at the truffiere) live in Manjimup – whilst another five are flown in with their trainer Adrian from NSW for a three month period. The bulk of their truffle (approx 95%) is sent overseas where there is increasing demand from the world’s top chefs. France and the US are particularly big markets, each buying over 1 tonne of their truffle each year, with Hong Kong a close third. The Chinese market could be even bigger but the government banned the import of Australian black truffle following the Australian Government’s decision to ban the import of Chinese truffle. And how is this season shaping up? “The temperature dropped off 4 weeks earlier than normal in March this year so it should be a good year. We are already seeing surface truffles emerge, which is 1-2 weeks earlier than normal” says Stuart. T&W staff have a sweepstake on the total tonnage of this year’s harvest. We can’t reveal where the smart money is, but suffice to say it’s well over the amount produced in the last two years. 95% of their truffle is exported to major markets in the US, France and Hong Kong. My husband & I went to the Truffle Kerfuffle in Manjimup last year. We enjoyed a tour of the Trufferie & dinner at the Wine & Truffle Company. The innovative chefs included truffle in each course, including dessert. It was truly a gourmet’s delight & the whole experience was fascinating & fun. Well done Alf & your team, you have produced a world class product & an interesting tourist destination.